Rediscovering the Lost Art of "Having a Think"
Confession: My mind has been a jumbled mess lately. Between school starting for the kids, new photography courses in the works, and a constant barrage of depressing world headlines, I've been feeling completely out-of-whack. So yesterday morning, I said out loud, "Enough." I wanted to adopt a policy I've seen my children (and dog) following more and more these days: gazing out at the world and simply having "a really good think." I took my morning coffee (iced, milked, and sugared, because I don't like coffee unless it tastes like coffee ice cream) and parked myself in a comfy chair facing the forest in our back yard. I forced myself (yes, it was a physical and mental effort) to just sit quietly and watch the morning unfold before me. It was as though the back yard (which had seemed lifeless) came alive before my eyes. A tiny white butterfly flittered between blades of grass, drinking its dewy breakfast. A chickadee landed on the kids' swing-set, briefly. A golden aspen leaf drifted lazily to the ground. There were quite a few comical chipmunk skirmishes around the back yard. "High-tailing it out of there" is a perfect description of what chipmunks do when they decide to give up on a fight. In between these observations, I realized how long it had been since I'd gifted myself with pure time in the morning, just to ponder and observe. Much too often, between various work tasks and household chores, I've been guilty of checking in on the world's nonsense and noise (a very nerve-rattling business indeed). Now more than ever, I need to take time just to be still. I want to get back to basics. To keep the morning sacred. To heighten, to deepen, to breathe. Did you enjoy this post? Get more like it by subscribing to Joyfully Green via email or RSS reader: just click here. It's been very quiet around this blogspace lately, hasn't it? That's because I've been feverishly organizing my life. Planning out courses. Clearing out clutter. Reducing distractions. Making my lists and checking them twice! Okay, back to organizing my office--I'm on a ROLL! How 'bout you? What's your favorite trick for staying organized and clutter-free? Or are you just the opposite? I'd love to hear it! Joyful Reads for the Weekend, Vol. 37: Getting Crafty with Nature for Thanksgiving! I just celebrated one of those "big" birthdays--you know, one with a zero at the end of it. 4. If you're not much of a cake person, have ice cream cones instead. Preferably, with lots of sprinkles (or jimmies, or shots, or whatever you call those little candy toppings in your neck of the woods). 5. Play your favorite game (my vote is for Blokus) while listening to a slightly crazy mixture of your favorite music ever (for me, that's Radiohead's "Karma Police", Chopin's nocturnes, Nirvana Unplugged, Bach's Cello Suites, lots of U2, and anything by Neil Finn). 6. Take one of your favorite people with you to one of those little shops where you can paint your own pottery while chatting and listening to more good music. 7. End the day eating dinner with your favorite people in the world, (which is hopefully your family), preferably at a Mexican restaurant (which always feels like a fiesta). Get just a little bit tipsy on frozen strawberry margaritas, so that you can't take a proper photograph of the event. Pretend you were aiming for "an artsy shot" instead. 8. Tuck into bed, completely grateful for the day and all of the simple but wonderful things it held out to you. How 'bout you? How do you celebrate your big birthdays? I'd love to hear! P.S. For a kid's version of a simple birthday party, check out this post: Subtracting the Pony: Simplifying Kids' Parties. Thom Yorke on Broadway: Is Radiohead's angular lyricist a good fit? 1. I will not fret about packing up for the town beach. Basically, we need sunscreen, swimsuits, thermoses, and towels. We do not need to pack up our car like we're embarking on a three-month safari. 2. I will relax the rules. If the kids want to stay up later than usual at night or sleep later than usual in the mornings, so be it! If they want to get messy outdoors, we've got a hose to rinse them off. 3. I will take full advantage of the public library. The library is a year-round treat for our family, but in summer, it's got free outdoor concerts, too. 4. I will remember that I am not the children's personal entertainer. Of course, we'll do plenty of fun things together, but certainly not 24/7, nor even 12/7. While I'm teaching my two online photography courses in July and August, I'll prepare the kids with plenty of books from the library, sketchbooks, and art supplies. And then there's the Great Outdoors, which I'll heartily encourage them to explore. 5. I will not get suckered into buying souvenirs. We don't need to buy things to prove that we visited places. Photographs capture the moment a lot better than some plastic trinkets made in China. The "catalog people" are acting like summer should be rushed along to make way for fall. I, however, have other plans for the season. How 'bout you? How do you keep your summer simple? I'd love to hear about it! Join me in July: My online photography course, How to Take Better Photos of Nature and the World Around You begins on Monday, July 6th! No fancy camera is necessary (you can even use your smart phone). Ready to take better pictures? Sign up today at the link. Joyful Reads & Finds for the Weekend: Easy Summer Edition! We're in the thick of "May Madness" right now: School is winding down and the end-of-year activities are winding up--waaaay up! I've turned into what Pamela Druckerman says the French scornfully call "Maman-Taxi"--the crazed mom who shuttles the kids from one activity to another. I can barely figure out how I'm going to get my son from after-school play practice to his baseball game, with my daughter's piano lesson sandwiched in between. Taxi-Mom indeed! I really dislike the idea of over-scheduling kids (never mind myself), because I remember my own childhood as being relatively low-key. I took ballet and piano lessons, but I had LOTS of free time for playing outdoors after school. And yet, here we are today: Tightly booked. But the good thing about being temporarily over-booked is that it helps us to see what can fall away. To see which activities give us the most joy and which ones are just time-drains. I can see the light at the end of the tunnel with my daughter's dance lessons. She's been losing interest in ballet, but now she loves to play the piano. So, dance lessons will be dropped after the big recital in June. My son gave up fencing for similar reasons. Took too much time and didn't give enough joy. But he loves, loves, LOVES baseball, so that one's non-negotiable. It's not just the kids with multiple interests and minimal time. On my way to find my son's baseball gear, I nearly tripped over the sewing machine that I'd bought for myself over a year ago. I've used it exactly two times, including once for a beginner's sewing class. While the class seemed interesting on the day I took it, I have to admit that I can't even remember how to thread the bobbin anymore. If I have a free half-hour, nine times out of ten, I'll reach for my camera. Zero times out of ten, I'll reach for a new sewing project. I'm terrible at math, but I think that says something. There are only so many hours. Our ongoing task is to find the essence of our days--the things we love, the things we truly need to do--and skim off the rest. How 'bout you? Have you simplified your activities or are you stretched to the limit? Let's hear it in the comments section! A Picture of Heaven...or New Jersey?! I just got back from a lovely ski weekend in Great Barrington, MA with my family. (Well, to be technical, my husband and daughter went skiing, my son went snowboarding, and I went photographing!) While I'd love to show you some pictures from the ski trip, I thought you might like a little break from all of the snow and ice lately...to take a little vicarious vacation to Hawaii! Aside from a couple of posts featuring the work of my photography students, I've featured other photographers here only twice before. But I'm making an exception again, for one of my nearest and dearest friends, Michael Graziano, whom I've known since we were 16 years old, when we met at a summer arts program for high school students at Wesleyan University. For the past twenty years, Michael worked at Broadway Cares/Equity Fights AIDS, and as its Producing Director, he helped raise millions of dollars for its charitable efforts. Last August, he decided to step down from his high-profile job and step out into the Great Unknown. I've been thoroughly enjoying his Facebook updates (let's be honest: how many friends can you say that about? ), and I'm betting you'll enjoy this armchair trip, too. The following quotes are Michael's updates from Facebook, and all of the photographs in this post are his, taken with his iPhone (all used with his permission, of course!). September 23, 2014: "An adventure begins this week. I am off to live in Hawaii for 4 months, volunteering at Kalani retreat on the Big Island. I'll be living in a tent, which I bought from an Italian gal who is leaving for Costa Rica. I am bringing few possessions--clothes, some good books, a journal, my good-luck necklace that I bought in Amsterdam when I was 20 years old. I will be living in the shadow of the Kilauea volcano, nature's reminder of its own awesome power. How will I be touched, humbled and changed by dangerous Pele, the ancient Hawaiian goddess of fire and volcanoes?" October 15, 2014: "I am making friends with some new members of the animal kingdom here in Hawaii such as this gecko. There are also the feral cats that live on the property and are very sweet. Less friendly are the wild pigs that roam around my tent at night but they scare easily. I am trying to avoid the dreaded fire ants which pack quite a sting. Sea turtles can be seen in the ocean nearby but so far they have only poked their heads and shells out of the water and not ventured onto the land. So many living things to encounter!" October 26, 2014: "The lava approaches. We shall see what Madame Pele has in store for us this week. The closest town may have to evacuate but we are not currently in the lava path. It will likely cross the highway, though, so we will be cut off from civilization as new roads are made. The lava changes its path and rate of flow all the time so nothing is certain." November 15, 2014: "This guy has been living in the shower stall for a few days now. Seems to be friendly so far." December 10, 2014: "When I arrived in Puna in October, it was hot, humid and rained every day. Now that we are in the 'rainy season' of December, it is glorious with the sun shining, lower humidity, cooler nights and no rain for days. Perfect holiday weather." December 24, 2014: "These palm trees looked to me like snowflakes against the sky. Happy Christmas Eve from Hawaii!" January 12, 2015: "Night falls over my tent." January 13, 2015: "Cats. There must be close to 100 feral cats on property, fed by animal-loving volunteers and whatever they can find in the jungle. These cats act like dogs, begging for food or attention. This is Wilbur." January 17, 2015: "Sunset at Mauna Kea into the clouds at almost 14,000 feet." January 18, 2015: "Goodbye Kalani! I depart today after 3 and a half months filled with laughter, challenge and creativity. I shaved off my beard and hair yesterday in prep for the next leg of the trip. Time for new growth. I'll be exploring the islands for the rest of the month and head to New Zealand in February. Aloha Kalani friends!" © 2014 by Joy Sussman/JoyfullyGreen.com. Photographs and quotations within this particular post: © Michael Graziano. All rights reserved. All photos and text digitally fingerprinted and watermarked. Please do not use any of my photographs from my blog--or Michael Graziano's from this post--without asking first for permission at JoyfullyGreen.com@gmail.com and then clearly linking back to this site with photo credits. Site licensed by Creative Commons. Well, hello there! I've missed you! I'm happy to be back here, tap-tap-tapping away at the keyboard. The holiday break with my extended family was the longest break (actually, the only break) I've taken in blogging since opening up shop here in July 2012. I love my little corner of the internet, but it was good to step away from it for a bit and really, truly focus on the people I love whom I don't see often enough. Sometimes, you really have to give yourself permission to rest. I remember reading a thoughtful post called Extremely Important Priorities from Tammy, one-half of the brilliant blogging team at The Great Jollyhoombah (one of my all-time favorite blogs, which is sadly no more), about how we often concoct these long to-do lists for ourselves, chockful of tasks that (if we're really honest about it) we don't actually NEED to do. Yes, it might have been beneficial for me to keep on posting away through the December holidays, as the third session of my nature photography e-course was starting in January. (It started yesterday and I'm loving my new students already!) But as I watched more and more of my blogging friends sign off until the New Year, I felt a little twinge of envy, and it just felt right to join the holiday parade and hang up the "CLOSED" shingle for a while. But as I said, I'm happy now to be back. Refreshed. Recharged. Revved up to go again! That's the whole point of vacations, isn't it? While I was "on leave", I took LOTS of pictures (no surprise there), especially first thing in the mornings. I haven't quite figured out how to work a camera while wearing gloves, so my outdoor photo shoots would usually end when my fingers and toes went numb. And then I was doubly thankful for a toasty-warm house! Because I like to give experiences instead of stuff, as a Hanukkah present, I took my two teenage nieces out to dinner and then out for a shopping trip. (Yes, I know, the shopping part negates the non-commercial aspect, but they're teenage girls--I can do only so much green-preaching! And I admit, I did have fun scoping out makeup with them.) I love my nieces to pieces--funny, sweet, and whip-smart girls who have somehow escaped "Sullen Teenager Syndrome." Our uncle treated us to an afternoon in New York with a performance of Gilbert and Sullivan's "H.M.S. Pinafore" at the NYU Skirball Center for the Performing Arts. It was good ol' silly fun! I hadn't seen a G & S show since childhood with my dad. I also saw some very good movies, including "Into the Woods"--twice! That's always been my favorite musical. I saw it on stage in London ages ago (oh my, the set designs were GORGEOUS! ), and then I saw the taped Broadway show with Bernadette Peters. I loved the movie (obviously--I saw it twice), and Johnny Depp ROCKED IT as The Wolf (no surprise there), but here's a crazy opinion for you: I didn't think Meryl Streep was as good as Bernadette Peters. (There, I said it!) Don't get me wrong: Meryl Streep is amazing (naturally), but she missed the comedic timing of Peters. Lines that had the audience roaring with laughter in the play with Peters were met with near-silence in the movie theater. (It was a little shocking, I must say!) So if you liked the movie, look up the Broadway version with Bernadette Peters and let me know what you think. Lastly, I played "Master Chef" with my kids a whole lot during this break, whipping up yummy things like french toast, Chinese broccoli, fresh breads, and cookies. Life is really too short for bad bread, so once you get the hang of making homemade bread from scratch (I promise you, it's not that difficult), you won't ever want to eat the bland stuff in the cellophane bags again. All in all, 2015 is off to a very yummy start! Did you enjoy this post? Get more like it by subscribing (at upper right). Or catch my latest posts by "liking" my Facebook page, following me on Twitter, or circling me on Google+. Thanks for reading Joyfully Green! © 2014 by Joy Sussman/JoyfullyGreen.com. All rights reserved. All photos and text digitally fingerprinted and watermarked. Please do not use any of my photographs without asking me first for permission at JoyfullyGreen.com@gmail.com and then clearly linking back to this site with photo credits. Site licensed by Creative Commons. It's a challenge to come up with gifts for Hanukkah when (1) we're already tripping over the kids' overloaded toy supply and (2) we--the parents--don't want any more stuff for ourselves. Giving experiences has become one of our favorite ways to celebrate. But sometimes, you can combine a fun experience with choosing something small (and not pricey) to take home with you. Case in point: Last Sunday, we combined something that we (our family of four) all love--books--with someplace we all love to visit--Strand Books in New York City. I've written about it before, but it's hard to capture the essence of the Strand in photos because it's just soooooo big and sprawling--four floors of books (most of them secondhand, many out-of-print or rare) taking up a full city block. Yet it's somehow cozy at the same time, as you blissfully meander around the chock-full stacks with everybody else who loves books just as much. It's our collective Happy Place, for sure. We each chose a book that we instantly loved. (Actually, the kids chose three each, but they bought their other two selections with their allowances.) My 10-year-old son chose three spectacular pop-up books by Matthew Reinhart and Robert Sabuda. My seven-year-old daughter chose beautifully illustrated versions of The Hobbit, Alice's Adventures in Wonderland, and a 3-D version of Cinderella. I chose a book that's technically for children but I love it nonetheless: Maps by Aleksandra and Daniel Mizielinska. (I love a book that teaches me a hundred new things on every page.) That's a book I can put on the family room coffee table for everybody to pick up from time to time and devour. After a quick bite and drink across the street, my husband suggested we walk down to Washington Square. I'm so glad he did (and not just because I love the Henry James book!). The arch was all lit up, framing the big Christmas tree under it. It was already almost impossibly festive, and then a big group of joggers (all wearing Santa hats) launched into "We Wish You a Merry Christmas" to take it right over the top. Even though we don't celebrate Christmas, the sparkling city filled with music and lights was a beauty to behold. At home, we hid our Strand books away until the first night of Hanukkah (yesterday). It was the perfect day in the city together, and we all agreed it'll be our new holiday tradition. How 'bout you? Do you have a favorite holiday tradition? Let's hear it--I'm all ears! 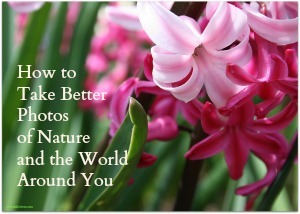 My photography e-course, "How to Take Better Photos of Nature and the World Around You" is now OPEN for enrollment! (If giving the course as a gift, please let me know the name and email of the student in the PayPal comment section at checkout.) Click here for details and registration. My favorite photographs (framed and unframed) are for sale at Society6. Here's one of my favorite ways to spend a lazy weekend morning: Making a creative, slightly crazy breakfast with the kids. (They're in full-on "Chef Mode" lately, thanks to "Master Chef Junior.") What's the dish they concocted, above? It's challah french toast, sprinkled with powdered sugar, chocolate chips, pomegranate seeds, and maple syrup, of course! It won't win any awards for good health (although the pomegranate helped me feel slightly less guilty), but it was good fun to spend Saturday morning whipping up something wild and wacky with my two little chefs-in-training. After making sure they stay safe in the kitchen, my most important kitchen rule for them is "be creative!" And my most important rule for the weekend is this: Let the kids relax, rest, imagine, play, create, and generally do their own thing (within reason! ), without hustling them off to activity after activity. I'm a huge believer in underscheduling children. How 'bout you? I hope your week ahead is carefree and delicious! My favorite photographs (framed and unframed) are for sale here! What's YOUR strategy for a stress-free holiday season? Or are you struggling to keep it together? Do tell in the comments section below--I'm all ears! My photography e-course, "How to Take Better Photos of Nature and the World Around You" will be running again this January! Save $15 with the Early Bird Discount if you enroll before Wednesday, December 10, 2014 at 11:59 pm EST. (If giving the course as a gift, please let me know the name and email of the student in the PayPal comment section at checkout.) Click here for details and registration.